Beach Walk Café at Henderson Park Inn If your special occasion checklist includes fine-dining ambiance, magnificent Gulf views, and delicious food, you can’t go wrong with the Beach Walk Cafe. In fact, if getting sand between your toes is your idea of perfect, the restaurant can even organize a ‘Toes in the Sand Dining Experience’ where your table is set up right on the beach itself. Vintij Wine Boutique & Bistro Since opening its doors in 1998, its location in a strip mall has not deterred its customers from coming back to enjoy its offerings. 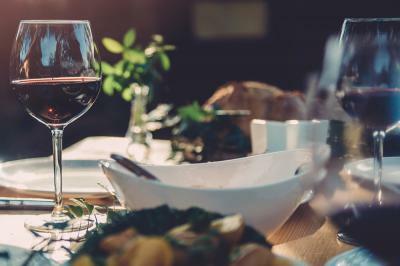 Of course, you can tell by the name that wine is definitely a game-changer here, and once you’ve tasted their innovative dishes made from the finest ingredients, you’ll understand just what makes this place so successful. Mimmo's Ristorante Italiano Who’s up for some delicious Italian fare? Once you enter into this cozy wood and stone establishment, you’ll instantly be transported into another world: one that’s filled with amazing food that will definitely delight your senses. Expect very generous portions that scream happiness, and if you’re a fan of garlic bread, you’ll want to give theirs a go. Dewey Destin’s Seafood This seafood restaurant isn’t exactly the easiest to find, but you’ll be glad you made the effort to. Its casual and inviting interior hits all the right notes, even if you do realize that you’re actually dining in a nondescript shack. Of course, seafood is the main thing to look forward to here, and with fresh choices, you can choose to fry, grill or blacken, this is a spot worth considering. Boshamps Seafood & Oyster House The name is derived from a combination of the family’s three dogs, making this place a lot easier to remember. However, since it opened its doors in 2013, their sustainable fresh seafood dishes have done most of the attracting and retaining. Wood panelled walls coupled with already gorgeous views of the Harbor and sandy beach is enough for most people to fall instantly in love. Every special occasion deserves to be celebrated to the fullest, and that means minimizing the amount of work and planning you’ll actually be doing and letting the experts handle the job. When it comes to driving on the road, you can definitely rely on our Destin, Florida limousine service to deliver. We’ll love to hear from you, so just give us a call or book our services online and start enjoying your time with us today!